HARRISBURG PA – A nationwide test of a federal emergency alert system, as well as wireless emergency alerts to cell phones, has been scheduled for Wednesday (Oct. 3, 2018) at 2:18 p.m., several state representatives reminded their constituents via e-mail. 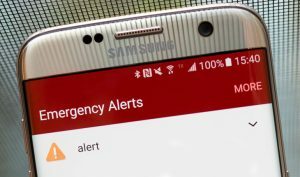 The cell phone alert system is expected to be used to warn the public about dangerous weather, missing children, and other critical situations through alerts on cell phones. Its test will be held first. Cell phone recipients cannot opt out of the wireless alert, according to the legislators’ reminder. Compatible cell phones that are switched on, within range of an active cell tower, and are served by wireless providers participating in the test should be capable of receiving its message, to be sent only once. Some cell phones will not receive the test message. The national alert portion follows at 2:20 p.m., involving radio and television broadcasters, cable systems, satellite radio and television providers, and wireline video providers. That test message will be similar to regular monthly messages with which the public is already familiar. The tests will assess readiness of the infrastructure for distribution of a national message, and is intended to determine whether improvements are needed.